If you want to impress at The Big Dance, you got to work on your moves first. Teams looking to make it to the 2017 NCAA Division I Cross Country Championships on November 18 must strut their stuff at the Regional Championships this weekend. The top-2 teams from each region earn automatic trips to Louisville, Kentucky, while the others must rely on all-important at-large points. 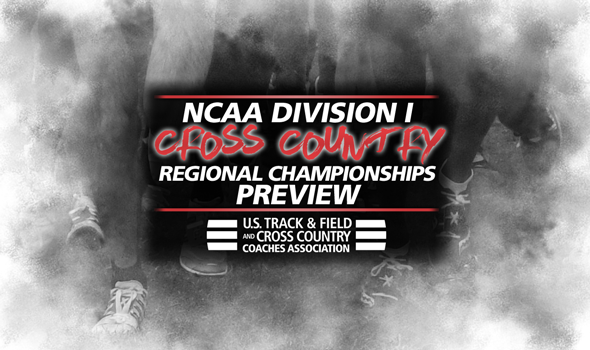 Regional Championships will take place from Pennsylvania to Washington and just about everywhere in between. Let us be your tour guide through these meets. We’ll list them by order of national impact and give the biggest storyline for each meet. Never before in the history of the NCAA Division I National Coaches’ Polls have the No. 1 men’s and women’s teams gone up against the No. 2 men’s and women’s teams at the same regional championship. It nearly happened in 2008 when the women’s race featured No. 1 Washington and No. 2 Oregon and the men’s race had the top-ranked Ducks, but Oklahoma State sat at No. 2 in the men’s index. Well, that all changes this year thanks to the Mountain Region. The men’s race pits No. 1 Northern Arizona against No. 2 BYU, while the women’s race will see No. 1 Colorado take on No. 2 New Mexico. The Lumberjacks and Cougars haven’t raced yet this season, while the Buffs beat the Lady Lobos by four points (47-51) at the Joe Piane Notre Dame Invitational in late-September. Northern Arizona and BYU have been on a collision course all season and it could very well an epic dogfight. We can’t forget about the five other ranked teams in the men’s race – No. 5 Colorado, No. 8 Colorado State, No. 12 Southern Utah, No. 16 Air Force and No. 23 Utah State – but the Lumberjacks and Cougars are in a class of their own. Colorado and New Mexico both enter Friday’s tilt on a roll, having atoned for previous setbacks. The Buffs bounced back from a runner-up effort at the Pre-National Invitational with a strong effort at the Pac-12 Championships (18-point win over formerly top-ranked Oregon). The Lady Lobos’ only loss on the season came to Colorado at Notre Dame – and since then, they cruised to team titles at both the Wisconsin Nuttycombe Invitational (87 points) and the Mountain West Championships (22 points). Based on past performances, here are a few men and women we expect to contend for the individual title in Logan, Utah. Men: Pick any of the top-5 runners from BYU (seriously), Northern Arizona’s Matthew Baxter and Tyler Day, Colorado’s Joe Klecker, Colorado State’s Jerrell Mock and Utah State’s Dillon Maggard. Women: Colorado’s Dani Jones and New Mexico’s Ednah Kurgat are the favorites to bring home the individual title. Jones recently won the Pac-12 individual title and Kurgat is 3 for 3 this year. The largest collection of ranked teams belongs to the West Region as there are 13 of them – a near-even split between the men’s and women’s race (seven and six, respectively). Going by rankings and recent performance, Stanford is the favorite to win the men’s title. The Cardinal enters the meet ranked fourth in the nation after winning its first Pac-12 crown since 2010. Stanford rallied to end Colorado’s lengthy streak and toppled region foes UCLA, Oregon, Washington and Washington State in the process. Portland held out several of its top runners from the West Coast Conference Championships and should be well rested for Friday’s 10K. The Pilots proved their mettle two weeks earlier in Wisconsin when they finished a distant runner-up to Northern Arizona and put three runners in the top-15 to beat both Syracuse and the aforementioned Cardinal. Oregon and San Francisco should have a great battle in the women’s race as both programs brandish top-end talent. The Ducks have frontrunners in Katie Rainsberger and Lilli Burdon, while the Dons are led by Charlotte Taylor and Weronika Pyzik. Stanford found its stride at the Pac-12 Championships and finished in a second-place tie with Oregon, but fell to third because of the tie-breaker. The Cardinal could muddy the scoring and has a solid one-two punch at the front of the lineup in the guise of Vanessa Fraser and Fiona O’Keeffe. Based on past performances, here are a few men and women we expect to contend for the individual title in Seattle, Washington. Men: Stanford’s Grant Fisher is favored, based on the fact that he has competed against and defeated every other man in the field between the Nuttycombe Wisconsin Invitational and the Pac-12 Championships. But nothing is guaranteed, so keep an eye on Portland’s Jeff Thies, UCLA’s Robert Brandt and Washington’s Mahmoud Moussa. Women: Pick a winner between Boise State’s Allie Ostrander, Washington Amy-Eloise Neale, Rainsberger and Taylor. All but one of the ranked teams in the Great Lakes Region squared off at the Big Ten Championships two weeks ago. That would be the 27th-ranked Eastern Michigan women, who won the Mid-American Conference title. Otherwise, both Michigan programs reigned supreme in Bloomington, Indiana. The 10th-ranked Wolverine men rounded into postseason form as of late, posting quality efforts at the Nuttycombe Wisconsin Invitational (eighth) and Big Ten Championships (first). Michigan beat both Michigan State and Wisconsin at each meet, so little should change here. The eighth-ranked Wolverine women cruised at the Big Ten Championships and won by a comfortable 31-point margin (55-86). Michigan beat 17th-ranked Wisconsin by 45 points and 21st-ranked Michigan State by 64. If the Wolverines complete the sweep, it will be the third time in the past five years that they’ve done it (2013 and 2015 were the others). Michigan’s women have won five of the past six region titles dating back to 2011. Based on past performances, here are a few men and women we expect to contend for the individual title in Terre Haute, Indiana. Men: Wisconsin seems to like the 10K distance, so look out for Oliver Hoare and Joe Hardy. If not them, Michigan’s Aaron Baumgarten could mix it up, as could Michigan State’s Clark Ruiz. Women: Indiana’s Katherine Receveur won the Big Ten individual title and was six seconds clear of any other competitor in this race. Michigan’s Jamie Morrissey and Gina Sereno are both big-race athletes and need to be up front for their team to win the team title, while Wisconsin’s Sarah Disanza is always a threat. Since 2012, four different men’s programs and four different women’s programs have won team titles in the Southeast Region. Virginia is the only program to repeat as a men’s and women’s champ, though not in back-to-back years. Look for the men’s race to follow the same tract as Furman and Virginia Tech enter as the top-ranked teams in the region. The seventh-ranked Paladins have been on the rise ever since a strong effort at the Pre-National Invitational, while the ninth-ranked Hokies burst on the scene during this past indoor track & field campaign and carried that momentum forward. By rankings alone, NC State could become the first women’s team to repeat as champs since Virginia did so in 2010 and 2011. The fifth-ranked Wolfpack weren’t tested at the conference meet (won by 66 points) and fared quite well two weeks earlier in Wisconsin (third place). Furman would need to pack up well behind Allie Buchalski to have a punching chance. Based on past performances, here are a few men and women we expect to contend for the individual title in Charlottesville, Virginia. Men: Campbell’s Amon Kemboi and Lawrence Kipkoech are running extremely well as of late, as is Liberty’s Azaria Kirwa. Virginia Tech’s Peter Seufer beat all three of them at the Pre-National Invitational and finished runner-up to BYU’s Rory Linkletter. Furman’s Aaron Templeton, who won the Southern Conference title by eight seconds, could be in there, too. Women: Seven of the top-10 finishers from last year return, not including Buchalski, who redshirted the 2016 season. Kentucky’s Katy Kunc finished third last year and is running well in 2017, while Eastern Kentucky’s Charlotte Imer as well as Louisville’s Dorcas Wasike and Charlotte’s Caroline Sang are ready to contend. Oklahoma State has won each of the past six men’s team titles. The Cowboys shared the crown with Oklahoma in 2012, but otherwise held it by themselves. The women’s team title has gone to three different teams in the past three years – Missouri (2016), Oklahoma State (2015) and Iowa State (2014) – but the Cyclones took five in a row from 2010 to 2014. Iowa State’s men won the Big 12 title and knocked the Cowboys out of the top spot in the most recent Regional Rankings, which ended a 61-week streak by Dave Smith’s team. If the Cyclones can do it again, they’ll prove themselves to be a possible top-10 contender at NCAAs, because you know Oklahoma State will be coming after them. Missouri came out of nowhere to win the women’s crown last year and has yet to find that same gear behind all-important low stick Karissa Schweizer. The Tigers finished fourth at the SEC Championships two weeks ago. Minnesota comes in as the favorite according to ranking as it is 13th, compared to 20th-ranked Iowa State. The Golden Gophers had a tough go at the Big Ten Championships, though, while the Cyclones ripped their way through the Big 12 on their way to a team title. Based on past performances, here are a few men and women we expect to contend for the individual title in Ames, Iowa. Men: Oklahoma State’s Hassan Abdi has won consecutive races and is looking to make it three in a row. Abdi won the Penn State National Open and continued his winning ways at the Big 12 Championships. He placed fourth in this meet last year. Iowa State’s Thomas Pollard is the next top returning finisher, followed by Tulsa’s Benjamin Preisner. Women: This should come down to Schweizer versus Kansas’ Sharon Lokedi. The edge would go to Schweizer based on past head-to-head matchups and how Schweizer is running as of late. Both met up at the Pre-National Invitational and Schweizer finished runner-up (Lokedi was eighth). Then at their respective conference championships, Schweizer romped by more than 30 seconds, while Lokedi beat the competition by six seconds. Syracuse’s men and Providence’s women have been particularly dominant at the regional level over the past four years. The Orange and Friars have combined to win seven of the past eight regional titles dating back to 2013 (Providence finished runner-up to Iona in 2014). Both Syracuse and Providence enter Friday’s meet as the top-ranked teams in the region. The Orange is third after easily winning the ACC title and the Friars are 10th following a rare loss at the BIG EAST Championships (Villanova won the team title by seven points). The biggest threat to their reigns in the Northeast Region is Iona on the men’s side and the Ivy League duo of Columbia and Dartmouth on the women’s. Based on past performances, here are a few men and women we expect to contend for the individual title in Buffalo, New York. Men: Syracuse’s Justyn Knight has been unbeatable since returning to collegiate action following the IAAF World Championships. Knight is 2 for 2 between the Nuttycombe Wisconsin Invitational and the ACC Championships, so there is little reason to doubt he won’t make it 3 for 3 here and three in a row in the region. If not Knight, look out for Colin Bennie or Iona’s Chartt Miller. Women: New Hampshire’s Elinor Purrier has won three races in a row, including the Pre-National Invitational over Missouri’s Karissa Schweizer. Purrier is the defending champion and should be considered the favorite. If not Purrier, Providence has a few women who could push the tempo: BIG EAST champ Catarina Rocha and Brianna Ilarda. Look out for Paige Stoner of Syracuse as well after the confidence-building win at the ACC Championships. With the way they’re running, Alabama’s men and Georgia’s women could capture their first region titles since 2010 and 2006, respectively. The question surrounding the Crimson Tide was whether or not it could find depth behind its talented trio of Alfred Chelanga, Gilbert Kigen and Vincent Kiprop. They went 1-2-3 at the SEC Championships and got some held from Andrew Bull and Garrett Bull. That’s why Alabama finished a game runner-up behind Arkansas and could make some noise at home on Friday. For the Crimson Tide to win the title, they’ll have to go through Middle Tennessee State and Ole Miss. The Blue Raiders are ranked 21st in the nation and are led by Jacob Choge and Kigen Chemadi, who went 1-2 last year at this meet. The Rebels are ranked 29th and won the meet last year with 46 points. The Bulldogs have put together a remarkable season thus far and come into the meet ranked 14th nationally. Georgia finished a clear runner-up to Arkansas at the SEC Championships and put two runners in the top-10: Jessica Drop (fourth) and Samantha Drop (fifth). Ole Miss is ranked 22nd and finished third at the SEC Championships two weeks ago. The Rebels only had one runner in the top-15 and need a stronger effort to keep pace in Tuscaloosa. Based on past performances, here are a few men and women we expect to contend for the individual title in Tuscaloosa, Alabama. Men: You’ll likely see a pack of five runners up front, which includes the Alabama trio and the Middle Tennessee State duo. Who wins is anybody’s guess. Women: Karisa Nelson of Samford is the top returner in the women’s race, as two of the three runners who finished ahead of her graduated and the other transferred to Oregon. You should also see both of the Drops in the mix as well as Eden Meyer from North Florida. Arkansas has swept the past four regional meets dating back to 2013. The last time the Razorbacks didn’t win both titles happened in 2012 when Texas upended their men. It wouldn’t surprise us to see Arkansas run away with the women’s title here as it’s the only ranked team in the mix and comes in at No. 6. The Razorback men will have their hands full with the Longhorns, based off recent efforts. Arkansas and Texas are both ranked 17th in the nation and the Longhorns already have a head-to-head win over the Razorbacks in 2017. Texas finished seventh at the Pre-National Invitational compared to Arkansas’ ninth. Based on past performances, here are a few men and women we expect to contend for the individual title in College Station, Texas. Men: Six of the top-7 finishers from last year are back in 2017, led by individual champion Emmanuel Rotich of Tulane. Going by that alone, Rotich should be favored – but he’ll have company in the guise of the Arkansas duo of Alex George and Jack Bruce, as well as Texas freshman Sam Worley, who finished a close third at the Big 12 Championships. Women: Out of those runners returning who finished in the top-10 last year, Baylor’s Lindsey Bradley seems to be in the best shape. Bradley finished third at the Big 12 Championships and 13th at the Nuttycombe Wisconsin Invitational. SMU’s Hannah Miller enters the meet fresh off an individual title at the AAC Championships, while Arkansas’ Taylor Werner finished runner-up at the SEC Championships. While there aren’t any ranked men’s teams in the field, you’ll see three women’s teams that were ranked in the top-30 of the most recent National Coaches’ Poll: No. 9 Villanova, No. 19 Penn State and No. 27 Georgetown. The Wildcats are on the prowl after upsetting Providence at the BIG EAST Championships two weeks ago. Villanova put four runners in the top-10, led by Bella Burda’s third-place finish. Burda also won the individual title at the Penn State National Open earlier this season. The Nittany Lions are the two-time defending champs in the region, but struggled at the Big Ten Championships. Penn State only had one runner in the top-15 and finished fourth. The Hoyas last won a region title in 2014 and have the experience to break that streak. Over in the men’s race, Georgetown is the favorite and enters the meet fresh off a title at the BIG EAST Championships. The Hoyas scored 40 points and put four runners in the top-15. Based on past performances, here are a few men and women we expect to contend for the individual title in Bethlehem, Pennsylvania. Men: Georgetown’s Jonathan Green seems to be back in top shape. Green won the BIG EAST individual crown and finished eighth at the Pre-National Invitational. As far as returners go, Princeton’s Conor Lundy (third) is at the top, followed by Villanova’s Andrew Marston (fourth) – and both fared well at their respective conference championships. Women: Penn State’s dynamic duo of Elizabeth Chikotas and Jillian Hunsberger should be at the front of the pack, as should the aforementioned Burda. Pittsburgh’s Gillian Schriever and Villanova’s Siofra Cleirigh Buttner both finished in the top-10 last year at this meet and are looking to get back to that form to help their teams fare well this year.